Boy had one of his crying jags today, all-howling, tears streaming down his face, break-my-heart kind of crying. And even though my back hurt, my neck hurt and I was all kinds of uncomfortable, I let him sleep on me. Because of the mother-guilt. Everytime I shifted positions because of the pain and discomfort, Boy would move ever so slightly to make it that much worse. Talk about a lousy nap partner. But it was OK, because he seemed happy, and there were no tears. 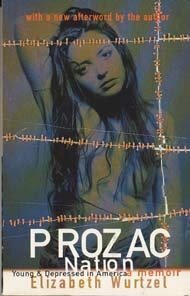 And for that reason, I ended up picking up the only book within reach to read, Prozac Nation by Elizabeth Wurtzel. And I'm glad I did, if only for selfish reasons - in that it's nice to know (OK, nice isn't exactly what I mean) that others are pretty messed up too because of parent's divorces in childhood and bad parental relationships. It makes things less lonely for me.